Climate change poses immense challenges to the New York metropolitan area. Rising sea levels are projected to render some of its most populated areas inhabitable. Already, storms are becoming more intense and predicted to become more frequent due to warmer seas. Four years on, the scars of Superstorm Sandy haven't been fully wiped away; this massive metropolitan region of more than 30 million has already experienced some of the climate chaos that will only increase in this century. 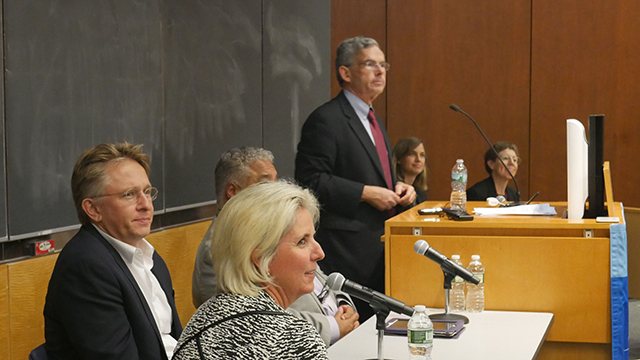 In recognition of the need for ingenuity and innovation at every scale, to advance a secure urban future the panel "Ensuring Urban Resilience: Come Hell or High Water", co-sponsored by the Sallan Foundation and the Sabin Center for Climate Change Law at the Columbia Law School, was organized to examine how New York City and Hoboken, New Jersey are working to effectively and efficiently adapt to the consequences of climate change and build resilience for all. 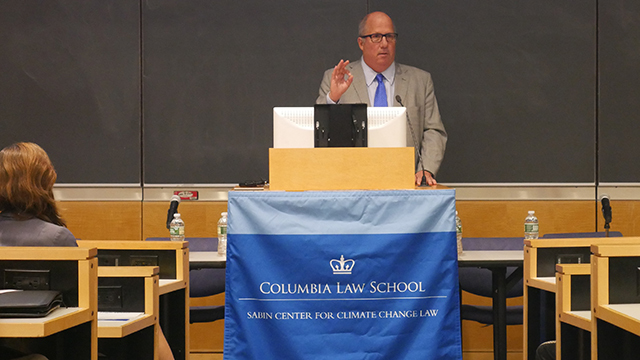 "We have a group of really outstanding speakers this evening to talk about the challenges that climate change is posing and will pose in the New York metropolitan area, and how we can and should become more resilient," said Michael Gerrard, Director of the Sabin Center for Climate Change Law as he began the evening's panel and introduced Nancy Anderson, Executive Director of Sallan Foundation and the event's keynote speaker. Ms. Anderson began by explaining what resilience means. "Too often we say resilience means bouncing back. But no, in the 21st century, resilient cities can't limit themselves to aspire to bouncing back because the conditions in which we have to survive and thrive are different. Resilience is learning how to leap forward." "I propose that urban resilience is inventing the paths to leaping forward," she said and invited the audience to a quick thought experiment — imagine New York and other cities becoming amphibious cities. She described New York City's evolution and how its iconic Great Seal changed over the years. Originally crafted in the colonial days of King James II, the top of the seal was his crown. After the American Revolution, the top of the seal was replaced with an eagle. "I would like to propose that the seal be modernized and forward-looking for the 21st century and replace that eagle with a frog, the ultimate green amphibious creature," she said, just slightly tongue in cheek. The event opened with keynoters Hoboken, New Jersey Mayor Dawn Zimmer and Christopher Ward, Senior Vice President of AECOM and former head of the New York/New Jersey Port Authority and the New York City Department of Environmental Protection. 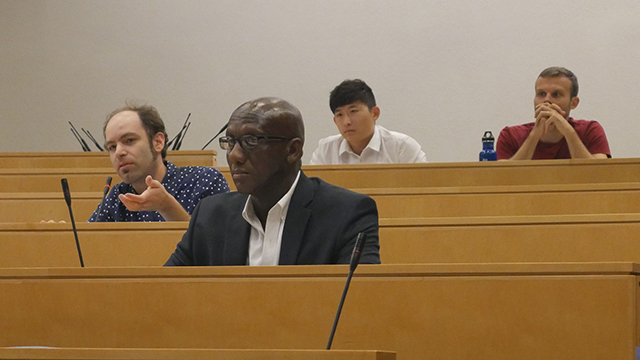 They presented deeply informed understandings of what government initiatives, urban design and the challenges of innovation in critical urban infrastructure must look like if resilience is to become a reality. 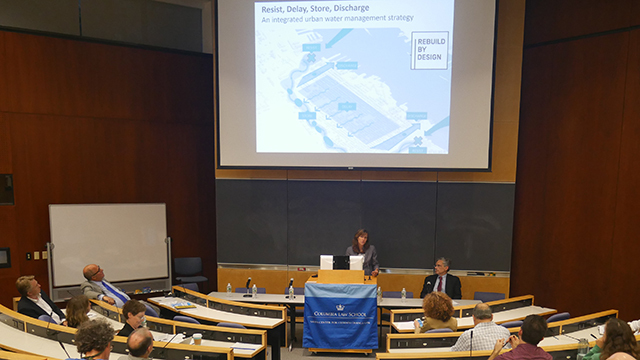 Nico Kienzl fleshes out the concept of "passive survivability"
Dawn Zimmer, the Mayor of Hoboken described how coastal flooding and storm surge are major threats to the city of Hoboken and how building resilience is "the most important objective" for the city. During Superstorm Sandy the water came in from different fronts and "filled up our city like a bathtub," she said, with the city being 80 percent under water. The city continues to face heavy rain events, and it has had eight or nine flash flood events since Sandy. Resist — Building infrastructure to prevent water from coming into Hoboken and also building in community amenities and playground space. Delay and Store — Delaying as much water coming through and storing any additional water. There are parks under construction, which can provide both recreational space and soft green areas to absorb floodwaters and more are being planned. A million gallon water detention system is also in the works. Discharge — In case of a flash flood, the city wants to build a pump station to discharging any water that comes through. Getting resident approval for this plan, however, hasn't been easy. "We hit a wall with our 'resist' alignment," Mayor Zimmer said, "We had major resistance from the community in the beginning." Hoboken residents didn't want to change the waterfront because it's a source of pride. With considerable pushback from the community and negative reporting from the media, there were concerns if this project would proceed. As such, her administration had to figure out how to build consensus if it was to proceed. She realized that everyone comes to the situation from a different place. While some don't want another flooding, others worry about property value. "This was a true community process, we listened to the community," she said. The residents were adamant that the wall must not go through a residential street, so her planners worked on an alternative. The Mayor explained how she also expanded outreach with the planners of this project and the Mayor herself held small neighborhood meetings all over the city. She emphasized that this was a collaborative design process and nothing had been set in stone. In order to show the importance of this process, her administration also showed the impact of sea level rise and coastal flooding if nothing was done. Design really matters — "especially in an urban environment you can't just build a wall, it's got to be something that fits in with the urban landscape." Design needs to be a true collaborative process. Communication is critical because a project could have a great design, engineering and so forth but "if it doesn't have community support, it's not happening." Resilience plans and project designs need to be based on solid engineering. The Hoboken project won $230 million through the Rebuild By Design competition and is the city is now conducting feasibility studies. Mayor Zimmer's aim is to make it a comprehensive plan, by helping individual buildings make themselves resilient as well. Mr. Ward began with a quote by Michael Harrington: "A fair and just society is built on the economy of surplus and the democratic means of distribution"
He talked about his tenure at the New York City Department of Environmental Protection as well as the the Port Authority of New York & New Jersey and how advancing infrastructure plans was possible by creating wealth which allowed for measures such as raising water rates. Today' however, the City administration's populist stance to reduce revenue-generating measures are an example of expedient, short term thinking that jeopardizes long term infrastructure security. "The paradigm of extracting wealth to build resiliency must be recognized," said Ward, "If you look at the city of New York and this last century of innovation, you are hard-pressed to see an economic growth model for the city of New York which is going to extrapolate the kind of economic expansion that you all have fundamentally taken for granted. It's highly unlikely that your iPhone is going to create the amount of wealth that invention of the airplane or the car or the train did or the combine harvester did in the Midwest. That kind of wealth is just not forecasted for the future." 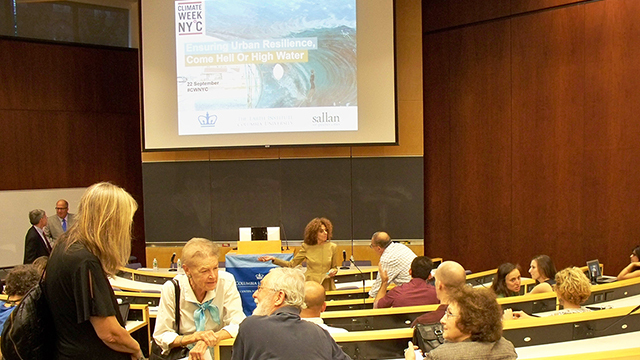 He also cited New York City's Coastal Resiliency Program for which the City received $179 million. "In New York, $179 million wouldn't get you on the subway as a matter of fact," Mr. Ward joked and emphasized the $3 billion requirement to build a protective wall. "Manhattan is looking at exactly what the Mayor of Hoboken has done — an integrated, architectural response to resiliency," but due to budget constraints Brooklyn gets the Berlin wall, running essentially along the 16 miles of the waterfront. He asked rhetorically, "Is that fair and equitable in terms of the wealth that we've extracted?" Mr. Ward then talked about AECOM's initiative to get elected officials and the public thinking about if they value equity, resiliency, sustainability and if they recognize economic growth as an important component of solving those three problems, then to consider: "where will the growth come from, where will be the economy to extract wealth from and how will we fund it?" "Unless we can begin ways to build resilience and economic development together and combine them as a model, we're not going to be able to protect our archipelago and our harbor, and we fundamentally will have to radically withdraw from the edge in a way that right now is unimaginable," he said in conclusion. 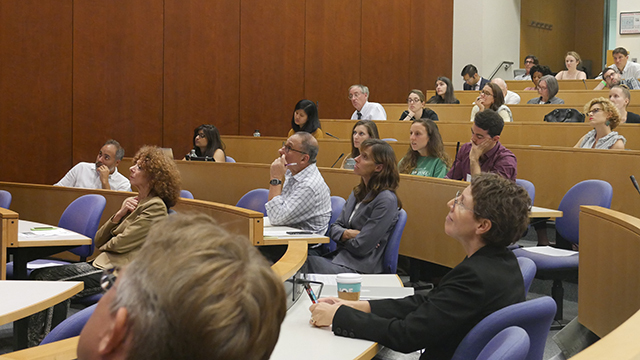 After the keynote presentations, five innovative and thought-leading panelists tackled an array of urban resilience, government-supported initiatives and urban design themes, the private sector's role, and, importantly, how to integrate environmental justice. "What can design do?" asked Kate Orff, when it comes to advancing urban design and resiliency. Urban designers are interpretive thinkers who are not experts but synthetic in approach, she said. In designing Living Breakwaters, a project on the south shore of Staten Island, her intent was to pull together the threads on the threats of climate change and loss of social cohesion in order to develop a project that was jointly physical and social and one that advances both goals of becoming more resilient and increasing social cohesion. Living Breakwaters has received $60 million from the Governor's Office of Storm Recovery. It consists of two-mile string of linear breakwaters that are coupled with an onshore protective dune. In order to build resilience for the present and the long-term, her team came up with a multi-layer design. "Rather than building a singular wall, the idea is that we have layered strategy that can help reduce wave action and reduce the effects of flooding. But in that process we are also socially-minded and aim to integrate social life into every aspect of this kind of resilience section," she told the audience. "Our concept is also that resilience is as much as a social and community project as it a physical design project." Ms. Orff explained that she viewed the project not just as a physical placement but rather something that has a presence beyond the two-mile extent and one that reconnects Staten Islanders to their shorelines. 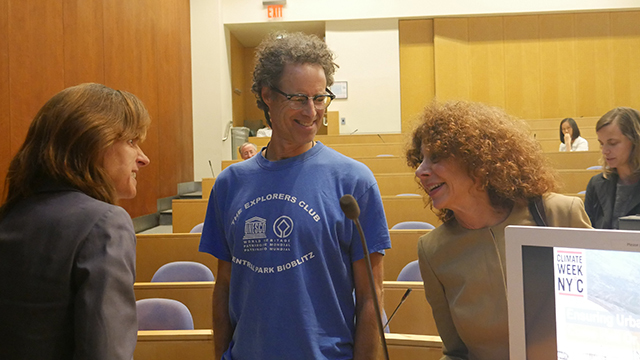 "We see our project as really training the next generation of harbor stewards." This project, just as in Hoboken, ran into a constellation of legal and community challenges. Ms. Orff talked of how the team devised a community outreach strategy that help build awareness and full understanding of what the project does and doesn't do. "We've hosted events and provided this kind of outreach at a point where it is the community that is actively advocating for our project". Now, the project has achieved cross-cutting support across community, local, state and federal levels. "It is a kind of a canary in the coal mine of these large scale resilience projects and what they will mean for our regulatory system and our urban landscape," Orff concluded. 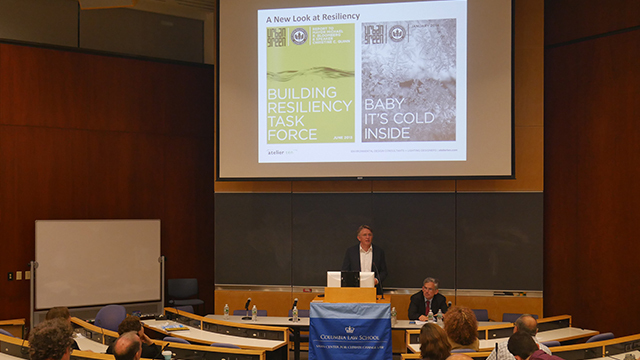 Mr. Kienzl highlighted the importance of addressing resiliency of urban buildings and looking at the building-level intersection between resilience and climate mitigation. "Some of the strategies we are using to make our city more resilient can also help us in how we address climate change." He fleshed out the concept of "passive survivability" — how building can actually provide shelter in times of a major event and for days thereafter. "During Sandy we were lucky that it happened during moderate weather," because had it been cooler or warmer, residents would have had a harder time without electricity or adequate heating. They might have been unable to live at home had the weather been different. His firm, Atelier Ten, conducted a study to understand how buildings can become energy efficient and also become more resilient in times of a major weather event. Using a previous study by the Urban Green Council, his firm modeled what would happen if there were a blackout during the winter or during peak summer. What his team found was that if a city's building stock was energy efficient, everybody could stay safe within the building for a longer period of time, even without power or heat. He also pointed out that the current New York City building code does not address heat-stress viability as much as it does for cold issues, even though heat is a well-known public health stressor. "If you look at high performance solutions, the beauty about them is that the strategies we have right now, whether we look at sun shades, better air ceiling, better insulation, this is a real win-win on both sides where we ensure higher safety, longer safety period in buildings. These buildings will also dramatically would help in reducing energy consumption and help meet our long-term carbon goals, thus reducing the rise of temperature and climate change impacts," he told the appreciative audience. Insurance is an amazingly powerful tool that unfortunately remains an underutilized risk management tool, Ms. Patton explained, "Especially with respect to leveraging the power that insurance can provide to improve resilience within communities." A major challenge is that many of the risks we face at present simply weren't contemplated in traditional risk management assessments including venerable programs such as the National Flood Insurance Program. "When the risk structure assumes riverine flooding in cities is the problem when in reality it's flooding and storm surge, no wonder there's a little challenge here," Ms. Patton emphasized. She described a study done just a few years ago that examined how underfunded the US was with respect to resiliency. It found the nation was underfunded to the tune of $1–5 trillion on a federal level. Why? One reason is that insurance is hard to deploy is because most of the federal dollars available for funding are focused on post-disaster mitigation. "The money is not focused on proactive cognitive evaluation of risks and a methodological resolution to improving resilience," she explained. So how do you improve resilience through insurance? 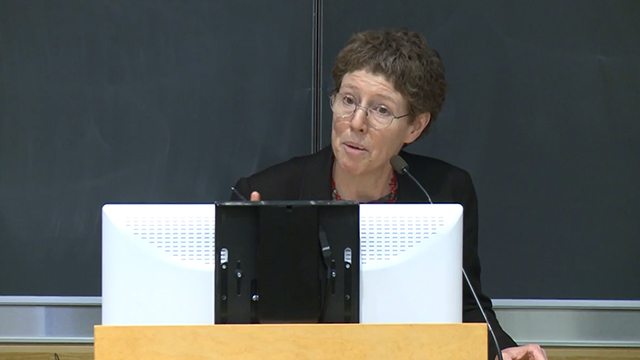 "We have to overcome information asymmetry and we have to manage data errors," Ms Patton said, explaining that with present calculations, it would take us 100 years to rebuild ourselves to the resilience levels that are now predicted to meet climate change impacts. "We have to figure out how to increase capacity and finance tools are one of those tools," she said, "Everyone else's comments today really show how important it is to figure out what it is that you are trying to make resilient. Then you can figure out how to finance it and align interest. Even though several find insurance boring or risk as something to worry about in the future, "insurance in its core form provides a set of social services that are absolutely unrecognized," Ms Patton stressed. To illustrate her point, Patton described a study done by the chief economist of Bank of International Settlements (BIS) that looked at large natural catastrophes. BIS sought to determine the effect of one of the disasters on GDP when the affected region was inadequately insurance or had adequate insurance. The study found that without insurance, bouncing back was extremely difficult but when everyone had similar insurance, recovery was possible at a faster pace. "Your community gets rebuilt, jobs come back and your structures come back!" In the event of a region being struck by two disasters in a 10-year period, uninsured communities just never recover. By contrast, adequately insured communities witness higher GDPs because they are rebuilding and generating more jobs. "Disaster is sometimes good for the economy if you are adequately insured," Patton said. She concluded with this observation, "I think we have an opportunity to rationalize how we use insurance to incentivize and continue to push communities to get there. But it's going to require reform of the way we price. A rethinking of how we align investment and infrastructure because that stabilizes the price for insurance. But it also gives an opportunity to make sure that when the wind blows, the sea rises and when the water comes in that you just get that stuff out and you can come back and have coffee with the neighbor and go back to work." Eddie Bautista started by making the point that helping poor communities protect themselves from climate change also helps cities protect basic amenities such as food and power. 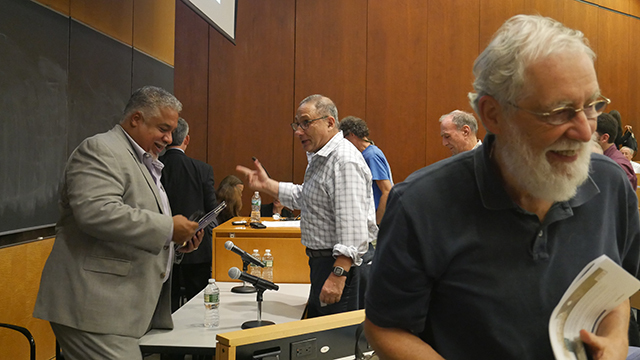 For background, he described NYC-EJA's's struggle to fight lower environmental standards for communities living in maritime and industrial areas. "But it was the 90s and it was the Giuliani administration. Some of you may remember that the only other thing that his administration was more hostile to than environmental protection was civil rights," he said wryly. In 2010, NYC-EJA decided to revisit the possibility for reforms. "What we had in 2010 that we didn't have in the 90's was the climate change toolbox," he explained. His team did overlays of significant maritime and industrial areas (South Bronx, Newtown Creek, the Brooklyn Navy Yard, Red Hook, Sunset Park and the north shore of Staten Island) with storm surge projections and found that every single one of these areas were vulnerable. "We are talking about Category 1 hurricanes, northeasters, just bad rainfall -- the potential for flooding in these communities was significant," he said and explained what made it alarming was that these problems were on top of the 20th century problem of having dense clusters of industrial and infrastructural uses in the communities. Mr. Bautista broke down the community demographics: there were 622,000 living in those at-risk areas out which 422,000 were people of color. He emphasized the threat of climate change not just to the people of those communities but for the region at large. He illustrated this point by citing the Hunts Point market, which is the largest food distribution center in the US. Had Superstorm Sandy hit during high tide, Hunts Point would have been swept away and significantly disrupted the region's food supply. "It's not just us, it's a regional problem." 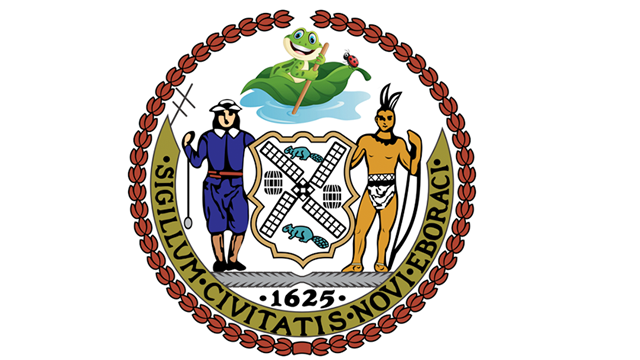 During the Sandy rebuilding process, Bautista's organization developed and circulated myriad recommendations, including looking at a number of coastal resiliency projects. Hunts Point won the Rebuild By Design competition and most of its work plan focuses on energy security. "It begs the question, what's the point of energy security if most of the people are standing in 2-3 feet of water?" he asked. 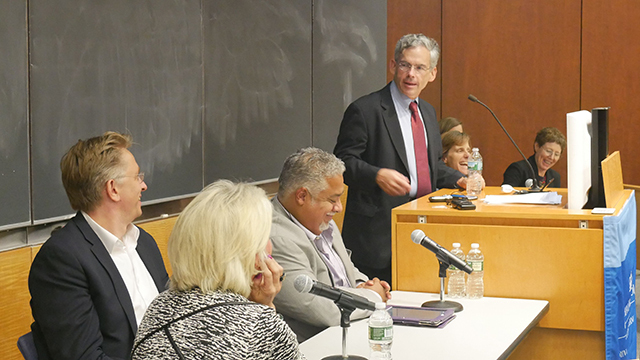 He criticized the City's current coastal protection program for channeling most of the money to Lower Manhattan, but also praised the plan for its focus on protecting public housing, "But the disparity that we have seen in terms of the built environment is in danger of being replicated even in the rebuilding now," Bautista underlined. Vulnerable communities question the "bouncing back" that resilience assumes. "Bounce back to what? Bounce back to an inequitable system that keeps replicating these kinds of disparities?" he asked. Mr. Bautista's take-away message was, "We can't be about bouncing back. Our position is that resiliency means bouncing forward. We need to take this opportunity to look at the inter-sectionality of systems that discriminate and create these kinds of disparities. And look to rebuild in a way that's not just smarter or more sustainable and more adaptable, but that takes into account that climate change is going to impact everyone, but its impacts are not going to be evenly felt". 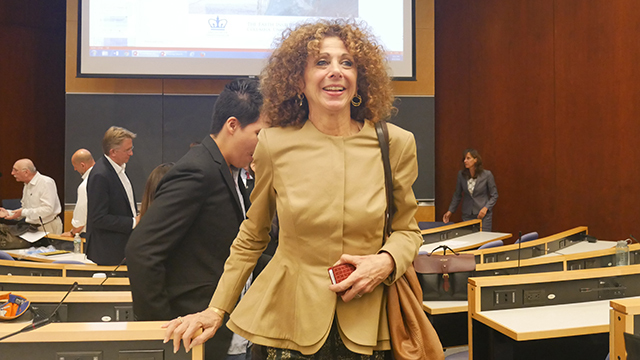 Joyce Klein-Rosenthal focused on several key strategies rooted in urban planning and design that are adaptive for resilience and extreme heat. "Heat has a very strong impact on public health," she said and noted its impact on vulnerable populations, senior citizens and those with chronic diseases. Given the fact that extreme heat events are increasing globally, she explained the need to marry economic develop and social constraints with urban resilience. 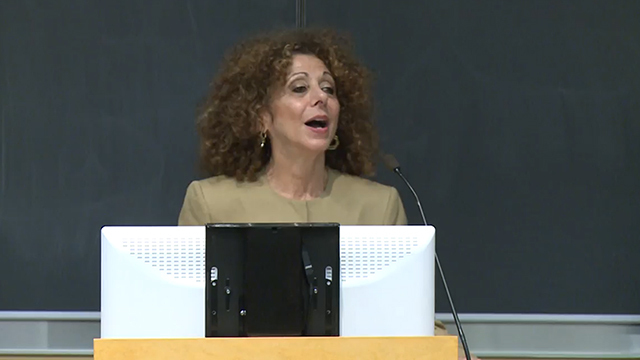 Klein-Rosenthal praised some of the strategies adopted by cities like New York such as increased vegetation, green roofs, bioswales, permeable pavements, cool roofs and increased use of water in urban areas. 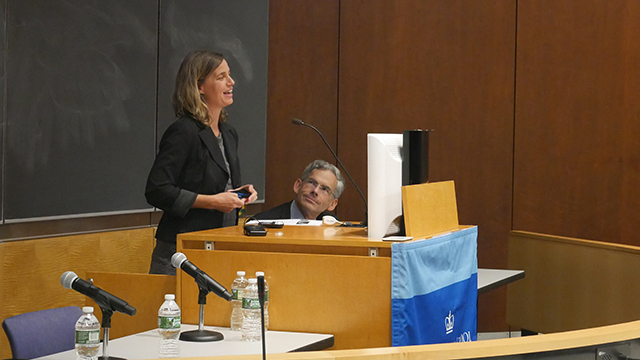 She went on to describe recent research undertaken with the Columbia University Mailman School of Health and the New York City Department of Health that examined over a 10-year period varying population vulnerability to heat health effects in the city. "It's of great concern that some neighborhoods have 40 percent greater mortality than others during heat events. This raises the question: what can we do about this?" "My research found that poverty in neighborhoods was the great effect modifier — that neighborhoods with high levels of poverty are really the only ones affected by the urban heat island effect," Klein-Rosenthal explained. She also said that she found the percent of black households were very strongly associated with decreased access to protective air conditioning, which further increases risk of heat-related heat issues. Research shows that heat hazards, their consequent health risks and population vulnerability are not distributed evenly across New York City and urban places in our region. A climate and health vulnerability analysis to evaluate intra-urban risk can help identify the characteristics of neighborhoods, buildings, and individuals that may increase exposure and susceptibility to health impacts, or be protective, and is often the first step taken by cities in their efforts to reduce the risks of excessive heat. Urban heat island (UHI) mitigation techniques can reduce temperatures both indoors and outdoors during very hot days, and thus decrease the risk of heat-health impacts, as well as reduce peak electrical demand. The selection, design and implementation of UHI countermeasures is context-specific — each urban area, and each city, neighborhood, block or building may differ in their characteristics that influence indoor and outdoor temperature and risk, such as their use of materials and urban design. Local government actions to reduce UHIs include the use of trees and vegetation (green space); cool roofs and pavements; green roofs and walls and smart growth strategies to reduce impervious cover. Regulatory policies include changes in building codes to require cool roofs, such as in the State of California and New York City (NYC), and the use of green infrastructure for stormwater management requirements. Communities can also encourage the use of voluntary UHI countermeasures through outreach and education and incentive programs (rebates and tax credits) — NYC's green infrastructure grant program is a great example. Identifying and protecting vulnerable populations should be a priority in a city's development of UHI mitigation policies, and for the implementation of cooling techniques, such as cool and green roof programs and tree planting initiatives. Our region should continue to investigate the multifunctional use of green infrastructure for UHI mitigation, including permeable and cool pavements and green walls for cooling neighborhood "hot spots", while experimenting with new approaches such as designing neighborhood "cool corridors". Plan for social equity first. Planning for equity first means attention to the distributional and process dimensions of environmental justice. First, prioritizing the use of cooling strategies in the low-income neighborhoods that often bear the greatest burden of heat-health impacts requires attention to the fair distribution of the benefits of climate adaptive planning. An inclusive urban planning process that actively seeks to work with residents and community groups can help ensure their participation and contributions. Adopt multi-functionality, such as using urban design techniques to combat flooding from stormwater runoff and extreme heat events; assess the co-benefits of heat island strategies. Experiment. "We're in an age where we're facing problems that we haven't faced before and there is a great need to permit urban designers to experiment and perhaps fail but to learn from that." Innovative demonstration projects, such as Rotterdam's now-iconic waterplaza, can help places cope with their specific problems, such as extreme precipitation events, while fostering international awareness of creative, multifunctional and sometimes low-cost design solutions. Comprehensive resources to plan for cooler communities are available through the USEPA and the C40 network, among many organizations dedicated to addressing climate change. Cities should take advantage of their resources to coordinate climate action with national and regional efforts. Shravya Jain is an associate at Climate Nexus, where she works on research and media outreach projects. She also writes the daily Hot News newsletter. She holds an MPA in Environmental Science and Policy from Columbia University's School of International and Public Affairs. She has interned with the United Nations for their in-house climate and sustainability efforts. Her subsequent internship was with Heron Foundation, a private foundation dedicated to helping low-income people and communities in the US through impact investment. Buchin, Oliver, Marie Therese Hoelscher, Fred Meier, Thomas Nehls, and Felix Ziegler. Evaluation of the Health-risk Reduction Potential of Countermeasures to Urban Heat Islands. ScienceDirect, 15 Feb. 2016. Web. 10 Nov. 2016. The EPA Heat Island Reduction Program website hosts information on mitigation strategies, climate risks and benefits. They have community action databases and webcasts on topics such as measuring heat island and evaluating mitigation strategies. For ten years, the C40 Cities Climate Leadership has shared strategies for urban climate action and now connects over 80 cities. Transnational urban networks such as ICLEI facilitate the sharing of practical experience and knowledge about heat island mitigation measures. Good Practice Guide: Cool Cities. C40 Cities Climate Leadership Group. 2016. Mitchell, Daniel et al. Attributing human mortality during extreme heat waves to anthropogenic climate change. IOP Publishing. pag. 8 July 2016. Web. 14 Nov. 2016. Adler, Ben. Should New York City Abandon Its Waterfront? Grist. N.p., 19 Sept. 2016. Web. 10 Nov. 2016. Bolstad, Erika. ADAPTATION: As Temperatures Rocket, Cities Fight Heat Waves. ClimateWire. E&E Publishing, 23 Aug. 2016. Web. 10 Nov. 2016. Bolstad, Erika, and ClimateWire. Living Shorelines: Will Get Fast Track to Combat Sea Level Rise Scientific American. N.p., 06 July 2016. Web. 01 Nov. 2016. Ginsberg, Mark, FAIA, LEED AP. BUILDING ENERGY — Fall 2016 — Resiliency for Affordable Multifamily Housing: What We Have Learned and What We Still Need to Know. Fall 2016. Web. 10 Nov. 2016. Goodell, Jeff. Can New York Be Saved in the Era of Global Warming? RollingStone. Rolling Stone, 5 July 2016. Web. 10 Nov. 2016. Milman, Oliver. New York's Remodelled Governors Island Has Built-in Climate Change Defense. 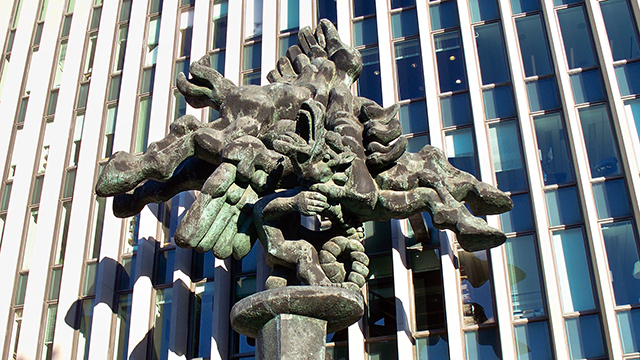 The Guardian. Guardian News and Media, 19 July 2016. Web. 10 Nov. 2016. Pierre-Louis, Kendra. Climate Change to Blame for Deaths in 2003 Heat Wave, New Study Says. InsideClimate News. 8 July 2016. Web. 10 Nov. 2016. Rice, Andrew. When Will New York City Sink? Daily Intelligencer. New York Media LLC, 07 Sept. 2016. Web. 10 Nov. 2016. Scarlett, Lynn. Nature: A Better, Faster, Cost-Effective Answer for Climate Resilience? Triple Pundit People Planet Profit. Triple Pundit, 26 July 2016. Web. 10 Nov. 2016. Schmidt, Samantha. Oysters Are Nearly Extinct in New York Waters. This Team Is Trying to Coax Them Back. NYTimes.com. New York Times, 04 Sept. 2016. Web. 10 Nov. 2016. Wood, Elisa. A Microgrid to Keep New York City's Fresh Food Supply Safe. Microgrid Knowledge. N.p., 16 Aug. 2016. Web. 10 Nov. 2016. Thank-you to everyone who Tweeted live from our event.